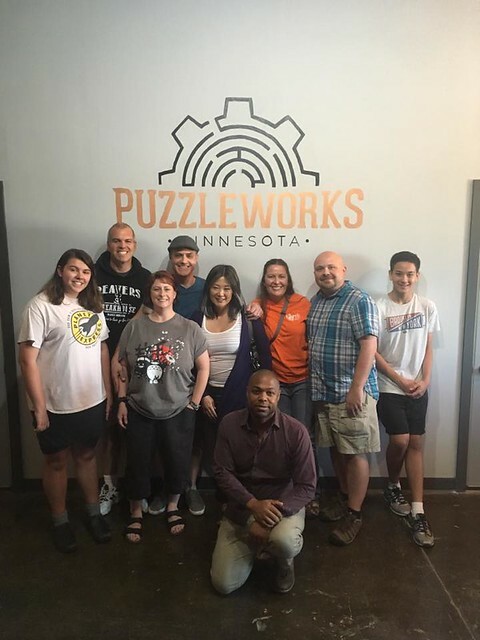 On Sunday, a bunch of us went to Puzzleworks next to Lake Monster Brewing in St. Paul, close to Cretin and 94. Robert wanted to check out the VR studio in the same building before we started, so we met him there and watched him wander around a rocky, Swiss landscape, throwing sticks for things that looked sort of like pigs. He also played a game where he could take the place of any of the defenders (bow/sword) in a castle defense type game. That one looked more entertaining. Here is in the studio. We wondered for a while how he managed to stop before running into a wall. Apparently he has a proximity detector we couldn't see on the display. That seems like a wise feature. It was a particularly good puzzle room. I won't talk about the details and puzzles, because that's mean, but it allowed us all to be working on something, individually or in pairs, simultaneously with minimal walking on top of each other. Maybe we were just really good at it by now (we've done three together if I'm counting right), but it seemed better suited to asynch exploration. This was our theme. We weren't really locked in the room. St. Paul has legal stipulations. I will say I was in charge of math. If you've done a puzzle room, that there's a bit of math won't surprise you. I seem to be the default math dude/ette. We finished in 51:47. Seemed really fast. He noted that they sometimes extend by five minutes as that gets the completion % up to 70. We did have one hint - but it was sort of an unnecessary one as we were already well on our way to done. I don't think I've written on a wall since the bathroom at the rental property/duplex when we lived there. Our success photo. We are the conquering heroes. 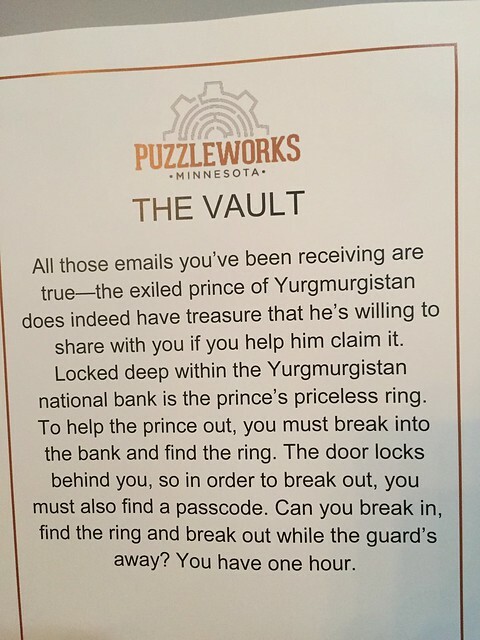 The Puzzleworks guide noted that there is a puzzle for 12 people. Robert seemed excited about the possibility. He's our puzzle room motivator. The guy next to me is Brett. 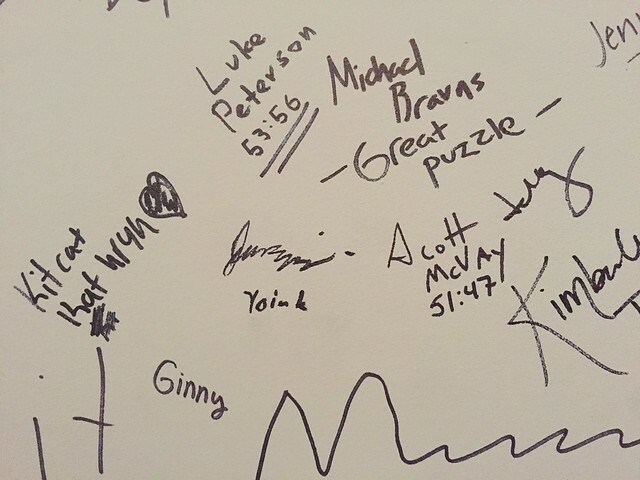 It was his first time in a puzzle room, although he's done a True Dungeon before like Eryn and I did at Gamehole Con last year (I don't think I ever blogged that, which is crazy. I liked it better than Hawaii and we're going again this year) which has some of the same ideas, it's just distributed. He had a great time, although he was a bit like me my first time in a puzzle room in that he wanted to see every puzzle that was being solved. Puzzleworks is great in that they give you a beer token for next door (or soda) at the end of the event. We'd been there only shortly before for my sister's birthday. Once again, my family missed the food truck. Robert had a copy of Cards Against Humanity in his car. 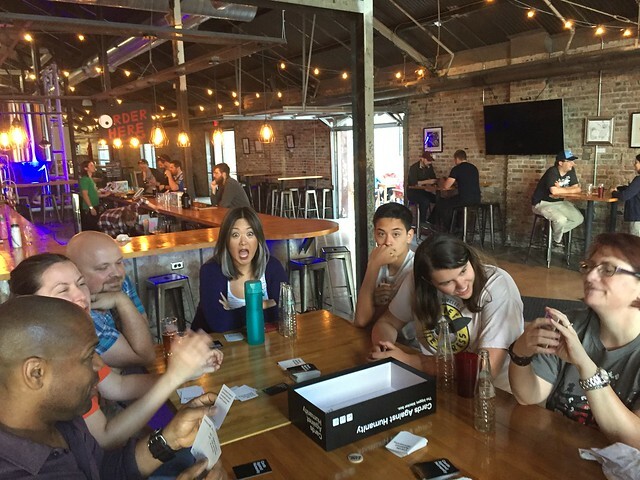 It was a fairly subdued game in some respects, partially because I kept picking tame cards to play. Which was a winning strategy. Gotta know your crowd. Great picture of Marie. Morgan is probably staring me down because he lost by one card.